The Beebe Auxiliary Treasure Chest Thrift Shop will host an Open House on Saturday, September 9, 10 a.m. to 6 p.m., in celebration of its 10 year anniversary. This event is open to the public and all are encouraged to come check out the special deals, as well as the games, prizes and drawings throughout the day. It is located in the Midway Shopping Center, 18675 Coastal Hwy. in Rehoboth Beach. The Treasure Chest Thrift Shop opened its doors in 2007, serving the community over the past 10 years. Its success is in large part due the dedication of its volunteers. “We love serving the community. We have so many volunteers that support us in our mission and we need many more volunteers to grow,” said Joe Pembroke, Manager of the Treasure Chest Thrift Shop. “This celebration is about honoring the past, celebrating the present, and looking to the future,” said Nancy Almacy, Auxiliary Board Member. The Treasure Chest Thrift Shop is open seven days a week, Monday-Saturday from 10 a.m. to 5 p.m. and Sunday, noon to 4 p.m. Donations are accepted Monday-Saturday 10 a.m. through 3 p.m. at the back door. Acceptable items for donation include: furniture (in good condition), clothing, shoes, household goods, linens, books, CDs/ DVDs/records, toys, seasonal and decorative items. All proceeds from the Thrift Shop benefit Beebe Healthcare. 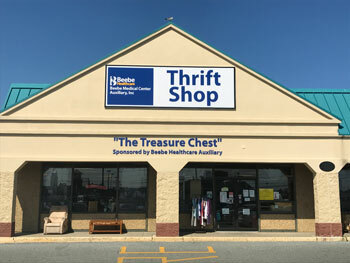 If you are interested in volunteering with the Beebe Auxiliary at the Treasure Chest Thrift Shop, call (302) 645-3531 or visit https://www.beebehealthcare.org/volunteer-beebe-auxiliary for more information. To reach the Treasure Chest Thrift Shop directly, call (302) 644-2878.